There are several avenues of professional development that I subscribe to, engage in, and contribute to, both online and offline. Modelling a growth mindset for the betterment of my own teaching practice is imperative as I work with my own students and coach teachers to adopt similar attitudes for personal growth. Below are a few samples of how I develop programming, demonstrate digital citizenship, and promote professional development practices in my district, across my province, and to my Personal Learning Network (PLN) globally. ONLINE: Re-Imagine Your Professional Development Experience... With Twitter! This is a video project that I created for my Mobile Technologies class (ETEC 565M) in the UBC Master of Educational Technology program. My personal journey with this social media has opened up and transformed my educational world. Because of Twitter, I have enjoyed several professional experiences over the past six months like connecting with colleagues at edcamps, traveling to California to attend conference and collaborate with other educators, and establishing online communities and conversations through hashtags like #bcedchat. I am passionate about the use of this tool, among many, to help educators connect and transform their own professional learning experience. Check out my video below to find out more! Thanks for reading, watching, commenting, and sharing! Happy tweeting! The EdTech Mentorship Network is a group of educators across British Columbia working to raise technological awareness, knowledge, and meaningful applications of technology in classrooms across the province. The complete summary of information about the EdTech Mentorship Network as a whole organization can be found here. In October of 2013, an idea was born out of a casual conversation with a colleague on Twitter: why not host an edcamp in our school district? With the support of my building administrator, we assembled a team who could most effectively put this "unconference" event together and make it a success. Since then, I have been working with district upper management, professional services, building administrators, teachers, students, support staff, and parents at organizing and promoting EdCamp35, which is slated to take place on April 12, 2014. From facilities bookings to organization of technologies and agendas, our planning team meets once a month to check in on the progress of planning the event. To date, we have almost 150 registrants for our district's edcamp debut, garnering extensive support from Langley Schools' District Leadership Team. 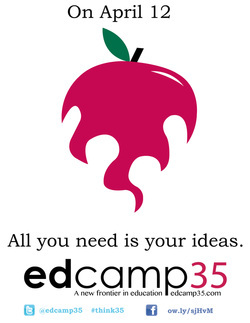 You can check out our EdCamp35 website here and our EdCamp35 Twitter handle here to find out more about our exciting inaugural Langley EdCamp event! Giving back to the community that taught me so much has been a focus of my professional work in 2014. It has already been a whirlwind of face-to-face meetings, conferences, edcamps, traveling, and presentations with many more to come. Embedded below is a slidedeck for a presentation that I put together for a conference within my district. The purpose was to introduce the SAMR Model for technology integration to teachers who had never heard of it before. I emphasize the importance of identifying where you are on the spectrum of SAMR in different lessons and focus on reaching technology integration goals in an attainable way. 06/19-20/14 - CanFlip Conference - Kelowna, BC - Presenting "Passion-Based Learning" and "Screencasting For Visible Thinking & Learning"
05/03/14 - GAFE Summit - West Vancouver, BC - Presenting "Learn How To Drive: Storage & Collaboration in the Cloud" and "Passion-Based Learning: Genius Hour, 20 Time, and Innovation Day"
03/20-22/14 - Computer Using Educators (CUE) Annual Conference - Palm Springs, CA - Presenting "Blow Up Your Classroom: Using Social Media to Rock PD" and "Elementary Microblogging: Connect Your Classroom with the Global Community"
02/21/14 - Odyssey 2014 - Langley, BC - Presenting "SAMR: A Technology Integration Model for Educators", "Explain Everything! Practical Uses and How-Tos For Screencasting on Your iPad", and "So You Want To Mystery Skype?"